Sesame seeds are native to both India and Africa. They are only 3-4 mm long and 2mm wide. These oil-rich seeds have a nutty flavor and add a delicate crunch to many Asian dishes. They can be found in salads, soups, crackers, sushi, or bread. 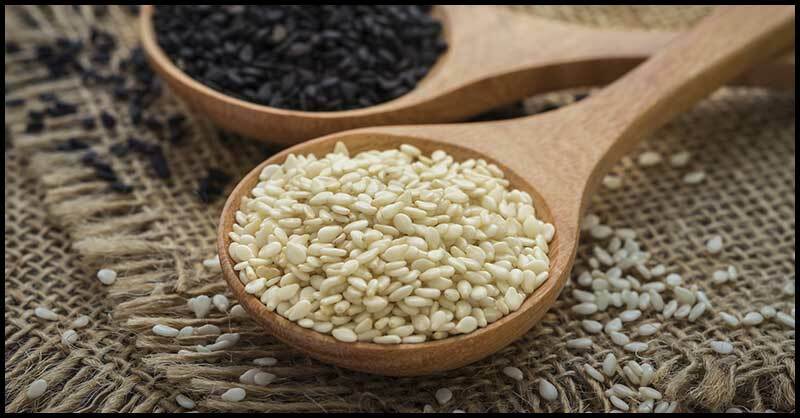 For thousands of years, sesame seeds have been used in folk medicine. Eating significant amounts (a small handful per day) of these seeds will provide your body with many potential health benefits. They can possibly protect you against diabetes and heart diseases. Sesame seeds are rich in natural oils, which have both emollient and laxative properties. Moreover, according to the USDA National Nutrient Database for Standard Reference, the tiny seeds are also packed with protein, dietary fiber, and antioxidants. Plus, they also have potent amino acids like tryptophan and fat-burning polyphenols like sesamol and sesamin. In addition to all of these, minerals such as iron, molybdenum, selenium copper, manganese, magnesium, phosphorus, calcium, and potassium as well as vitamin E and B vitamins are also present in these edible seeds. Osteoarthritis is traditionally treated with NSAIDs (Nonsteroidal anti-inflammatory drugs) like ibuprofen and acetaminophen medications (Tylenol). Another trade name for Tylenol is Panadol. Unfortunately, these drugs can harm your health as they can increase your risk of having heart problems, stomach bleeding and liver problems especially if they are taken in large doses over a long time. In a study published in the International Journal of Rheumatic Disease, researchers from Azerbaijan’s Tabriz University of Medical Sciences found that sesame seeds can significantly improve symptoms of knee osteoarthritis. Their two months study revealed that when it comes to knee arthritis, consumption of 40 grams (4 tablespoons) of sesame seeds was superior to 1000 mg of Tylenol with no adverse effects like kidney damages, heart attack, liver damages, and internal bleeding. Aside from helping arthritis, there were also other studies showing that sesame seeds can improve high blood pressure and diabetes as well as reduce the risk of colon cancer, pancreatic cancer, breast cancer, prostate cancer, lung cancer, leukemia, and kidney damage. The copper content of the seeds helps in the activity of lysyl oxidase, an enzyme needed for the cross-linking of collagen and elastin, which are the ground substances that provide structure, strength, and elasticity in blood vessels, bones, and joints. Dry roast sesame seeds or you may use them without roasting. Grind jaggery and sesame seeds into powder. Mix both and enjoy 1-2 tbsp. of this healthy powder regularly for joint pain relief. Grind 1 tbsp. of sesame seeds and boil it in 1 cup of water for 15-20 minutes on low heat. Let the tea cool down and drink it regularly.